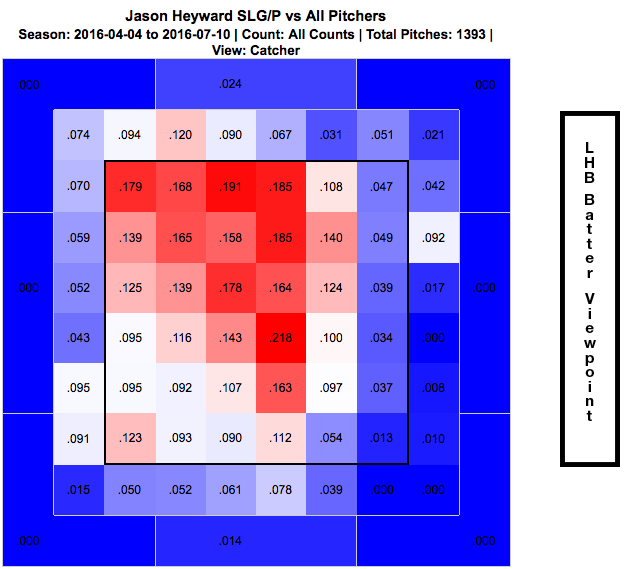 It’s always been easy to forget that Jason Heyward’s actually a pretty good hitter. The bar was set so high, with a 134 wRC+ as a 20-year-old in 2010, that it became easy to overlook his consistent above-average performance at the plate from 2012-15 as underwhelming. This year, it’s become even easier for Heyward to appear underwhelming, because for once, he actually has been. Heyward entered the 2016 season with a career batting line 18% better than league-average, and to this point in the season, he’s been 17% worse than league-average. It’s a big swing, and it’s turned Heyward from a player whose bat, when paired with his elite defense, made him a borderline superstar, to essentially a glove-only commodity. That glove alone has still provided the Cubs with a win or two already, but it’s certainly not what they paid for. Heyward’s shown some signs of life lately — he was a league-average hitter for the month heading into the All-Star Break — but even then, there’s been something that seems… off… about Heyward’s swing. It’s like a completely different hitter. Yeah, he’s doing more damage up in the zone than he used to, but the point here is that Heyward was once a good hitter, and he was so because he thrived low in the zone. Now, he’s no longer thriving in that area, and everything’s fallen apart. 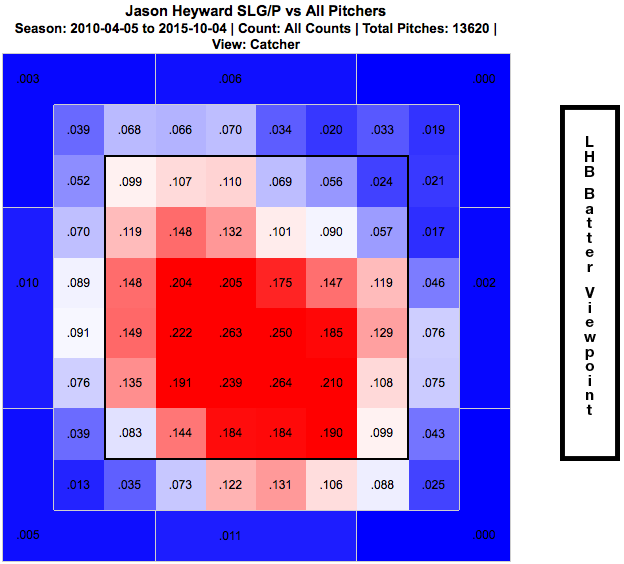 In 2015, Heyward hit like his usual self, and in 2015, Heyward slugged .376 on pitches in the upper-half of the zone and beyond, and slugged .462 in the lower-half. This year, his lower-half slugging percentage is just .299, which represents both one of the lowest overall marks in baseball, and also the second-largest decline of any hitter with at least 150 lower-half swings in each of the last two years. Heyward’s making less contact low in the zone. He’s doing less damage low in the zone. For whatever reason, he’s not been able to tap into what always made him a good hitter, and the result hasn’t been pleasant. For Jason Heyward to get back to star-caliber performance, he’ll need to start hitting, and for Heyward to start hitting, he’ll need to get back to his strengths. We hoped you liked reading The Hole In Jason Heyward’s Swing Is Glaring by August Fagerstrom! Somebody must have put a bullet in his bat. iVaya con Dios!